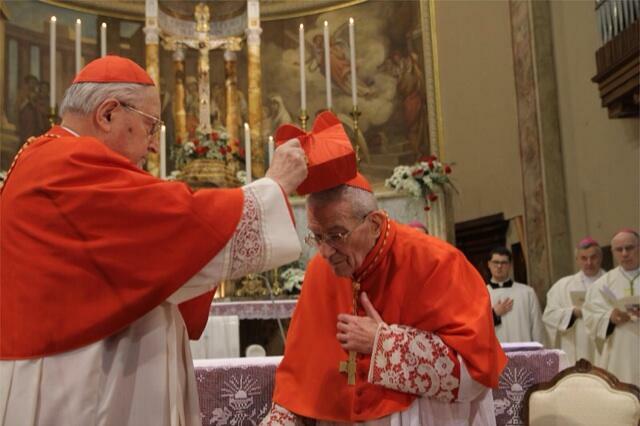 The Holy Father created 98 year old Archbishop Loris Francesco Capovilla a Cardinal of the Holy Roman Church. Because of age Capovilla did not go to Rome to receive the cardinal’s rad biretta and ring, so the Dean of the College of Cardinals, Angelo Cardinal Sodano, went to him to bestow the honor in Sotto il Monte. This town is the area where Angelo Roncalli was born. Cardinal Capovilla received as his titular church Santa Maria in Travestere. The former cardinal titular of Santa Maria is Jozef Glemp of Warsaw who died in January 2013. His Eminence has been a priest for 74 years and a bishop for 47. He’s the former archbishop of Chieti and the former Prelate of Loreto. The new cardinal was the distinguished secretary of Blessed John XXIII, to be canonized on 27 April 2014. A brief video of the ceremony is here.